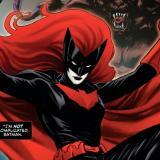 It’s been said that the casting dept is looking for a lesbian actress to play the part of Kate Kane. It would certainly make sense as it’s good representation and in-line with Berlanti Productions’ previous casting choices. Particularly Nia/Nal from supergirl being played by Nicole Maines in their fourth season (upcoming). So if we are trying to meet true representation, who would you like to see play Kate? She did do a great job and some sources are saying she is a front runner, but I believe the show said that they want a real lesbian for the part and I don't know her orientation. Chasty Ballesteros is another good one in our opinion.